Well, looky here. 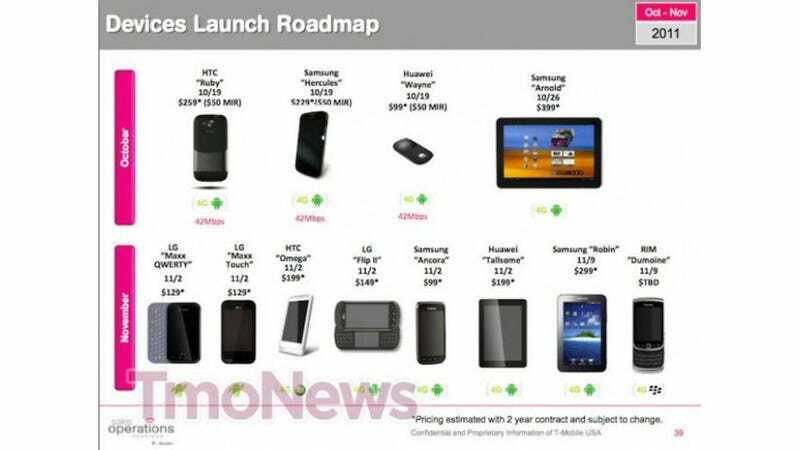 TmoNews has got their hands on what seems to be T-Mobile product launch roadmap for October and November. Take it with a grain of salt, but if half of this is right, there's cool stuff a-plenty coming. The roadmap shows 12 upcoming devices, all under their code-names. Let's get this out of the way, some of these dates are definitely wrong. It says the HTC "Ruby" (really the Amaze 4G), the Samsung "Hercules" (really the Galaxy S II), and the Hulawei "Wayne" (the T-Mobile Sonic 4G Mobile HotSpot) will launch on October 19th, when we know that they are pre-orderable on the 10th and buyable on the 12th. That aside, a previous leak that TmoNews nabbed pointed to six devices launching on November 2nd, which matches the above document. Why Are T-Mobile&apos;s Galaxy S II and Amaze 4G So Damn Expensive?